After the soak, put on your gloves and wring out the fabric as much as possible. Yup, use those muscles! You don’t want it to be dripping. It is best if you have a long table that can get a bit wet, or cover the dining room table. Divide the shorter end into the number of sections that you would like the design to multiply. I suggest less rather than more but it is up to you. I used 7 sections for a single duvet. Clamp it onto the table to hold the end or enlist someones help. Now you can divide the other end to the same sections and pull it tight to have a great accordian-fold. 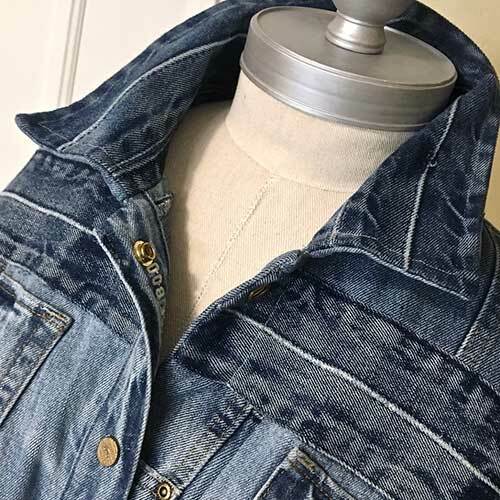 you can see some of the folding basics here. 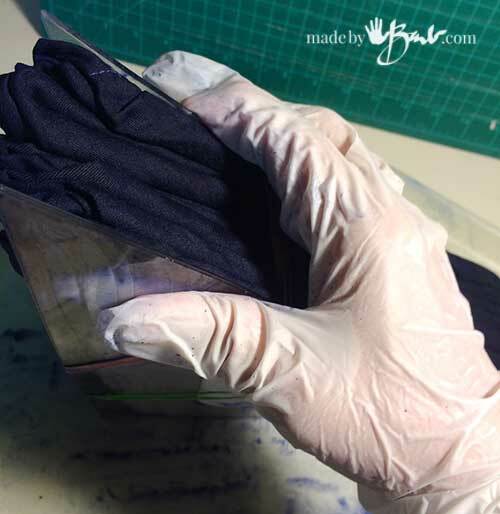 Fold carefully to try to keep the outer edges lined up as they are what take the dye. 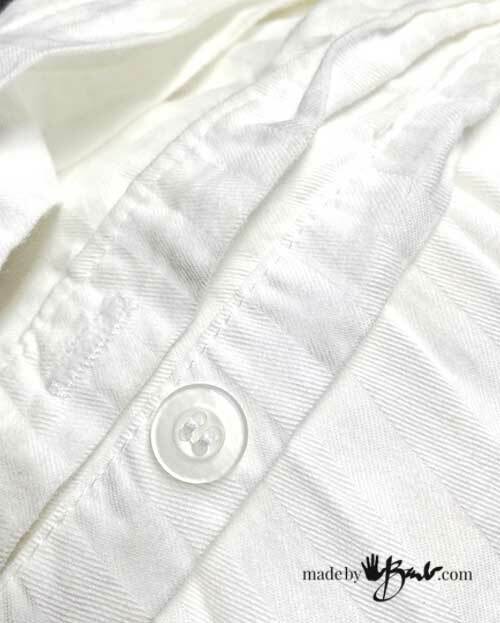 There is a certain charm to any creases so don’t stress too much. 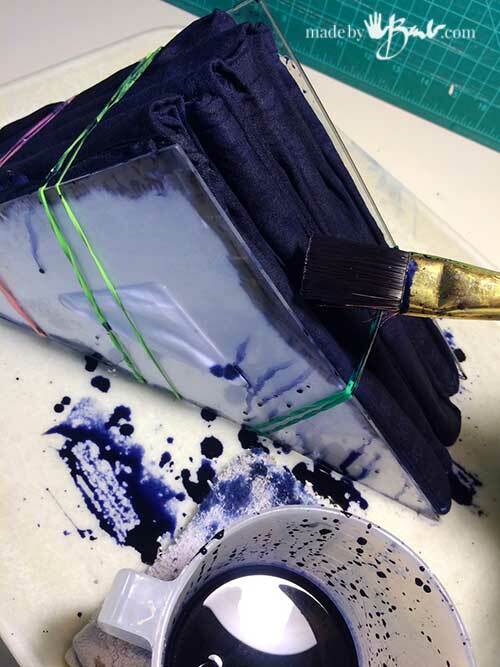 I had looked around for some type of panel I could use to keep it sturdy while dyeing and found my drawing tools called; ‘Set Squares‘, and they worked well. If you don’t have some you could substitute some other plastic panel or cover some sturdy cardboard with plastic. Secure the stack with some elastic bands. 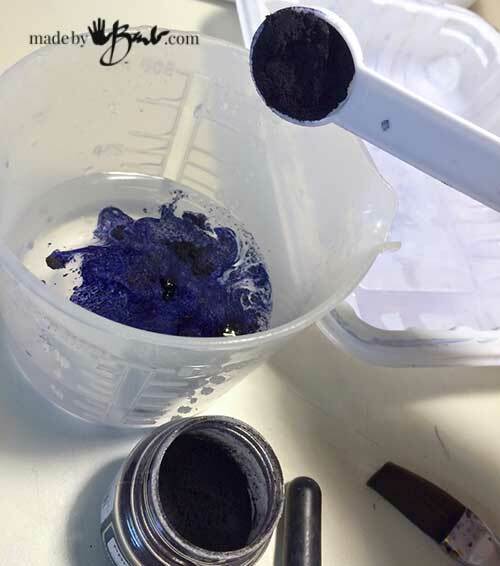 This fibre reactive dye will take a bit of mixing until it is all dissolved. Look carefully that there are no bits still floating. 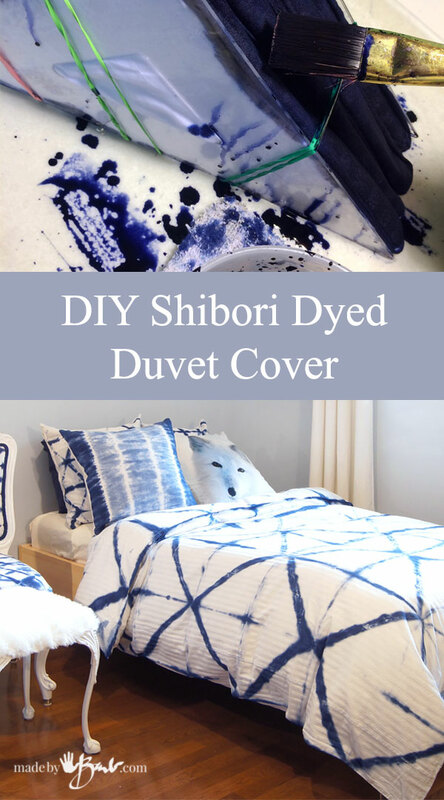 The traditional Shibori dyeing method involves huge vats of dye (which would scare me) and the fabric bundles are submersed. 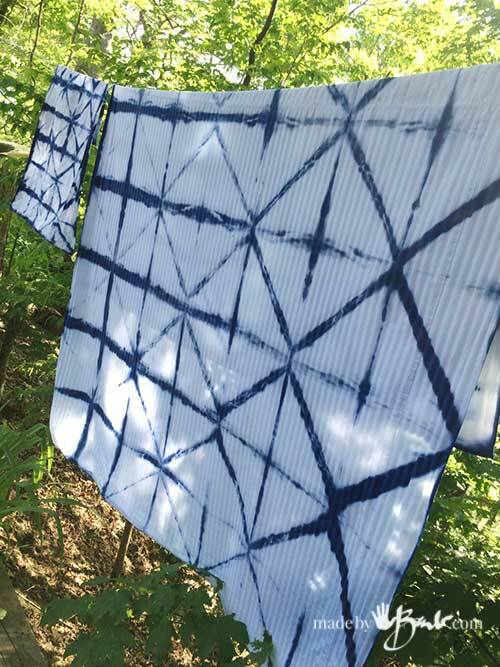 This simplified DIY Shibori method has no waste and less chance to get covered in ‘blue’. 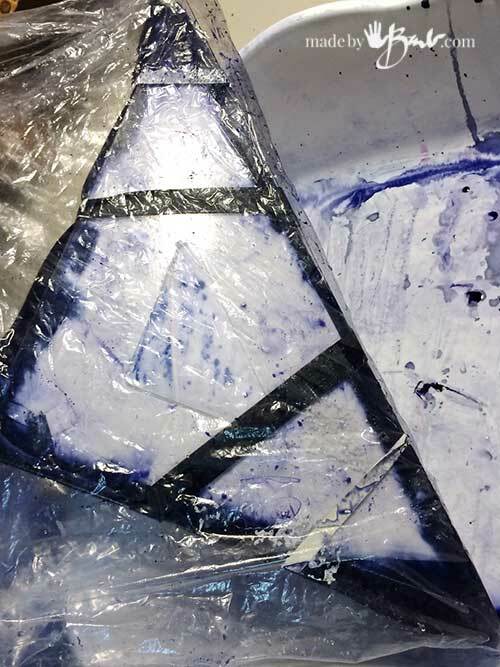 Paint or squirt the dye onto the edges, working around to keep it even. It will absorb the dye nicely. The colour intensity is lovely! 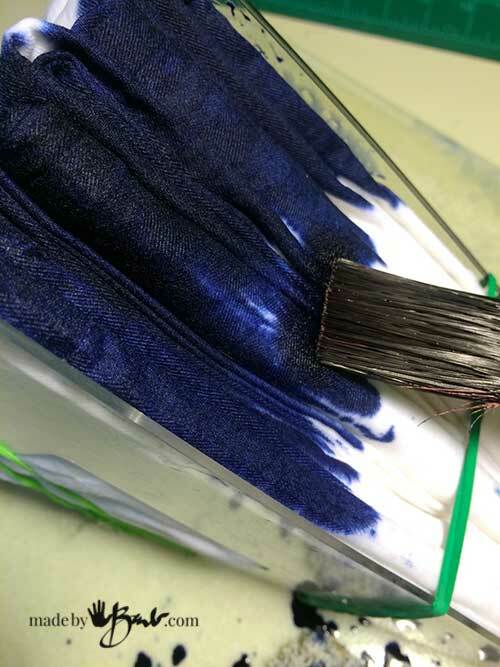 Fibre reactive dye comes in all colours but the navy is my favourite. 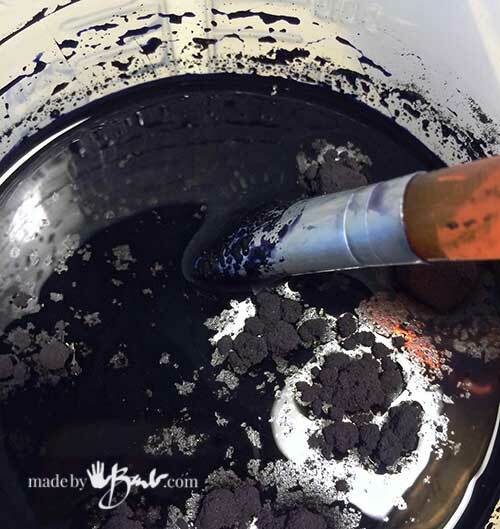 The dye will need to absorb through the layers to create the design by dyeing the folded edges. Don’t be stingy, as then the design will not be obvious. The best results come from having enough dye. I work in a tray to keep the mess down. I sneak a peek to see how far it has ‘bled’ through the layers. 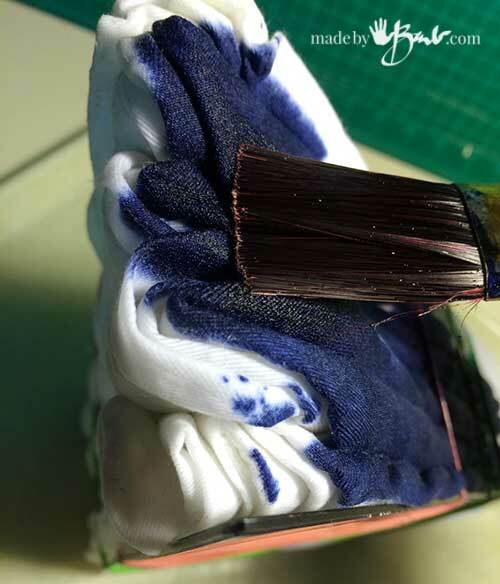 To further help the dye to travel throughout the fabric, squeeze the edges quite well. 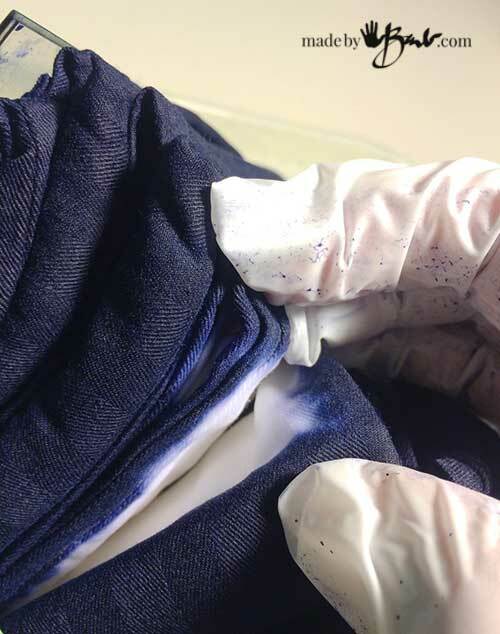 This Fibre Reactive dye has some options of processing times. 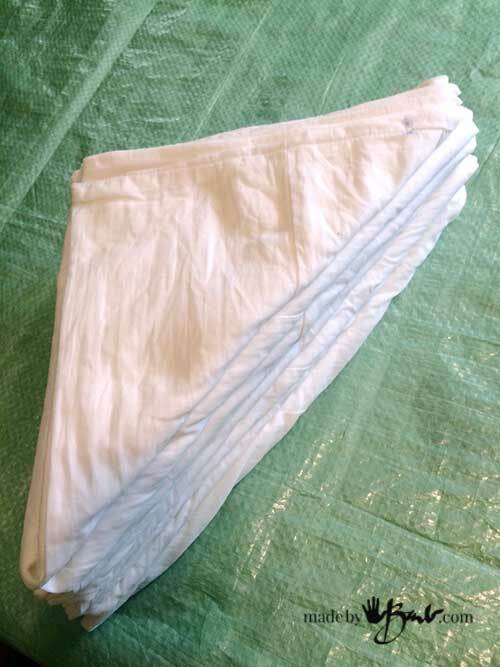 Place the bundle in a clean plastic bag. If you are in a rush you can use heat to set it faster; a dedicated microwave can warm it til hot to the touch (no metal allowed) or you may just leave it for 24 hours to use a longer set of lower heat (interior temperature). You could use the heat of the sun on a warm day in a garbage bag. 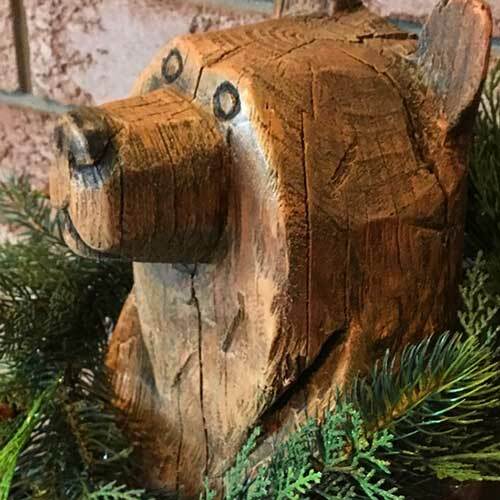 Visit here for some good products and tutorials. 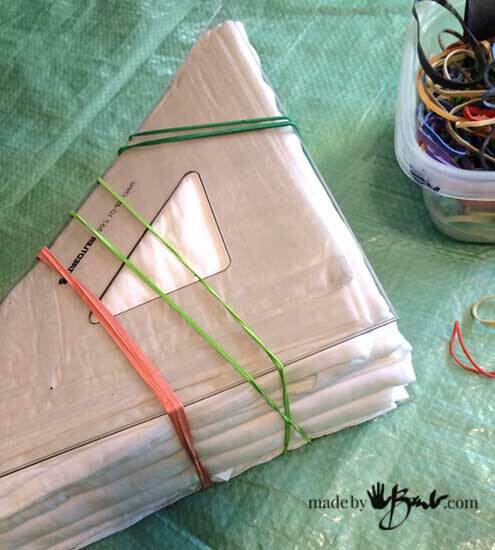 Once set (let cool if using heat), undo the elastics and rinse, rinse, rinse with cool water. 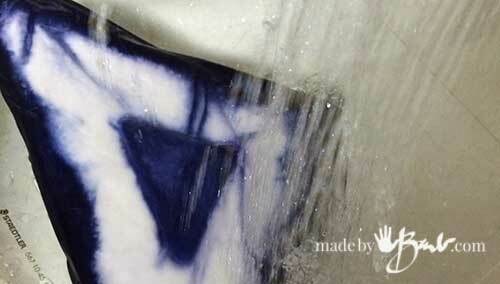 You want to rinse out all the residual dye with cold water so that it does not set on any un-dyed sections. 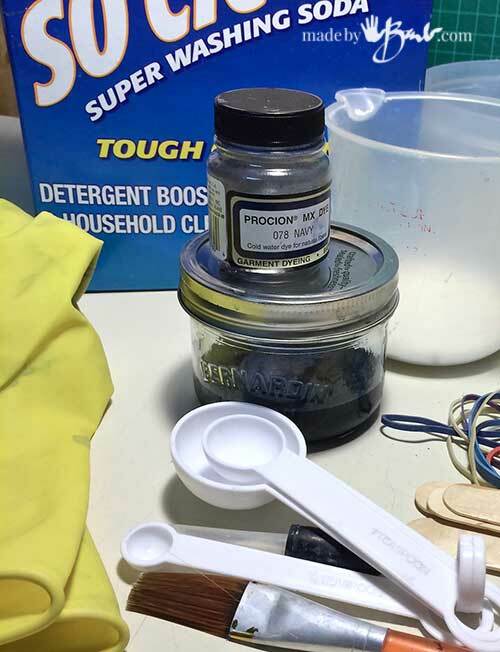 Once the water is running clear; you can add a bit of mild soap/detergent with hot water to give it a good wash.
You may just put it through a normal laundry cycle. 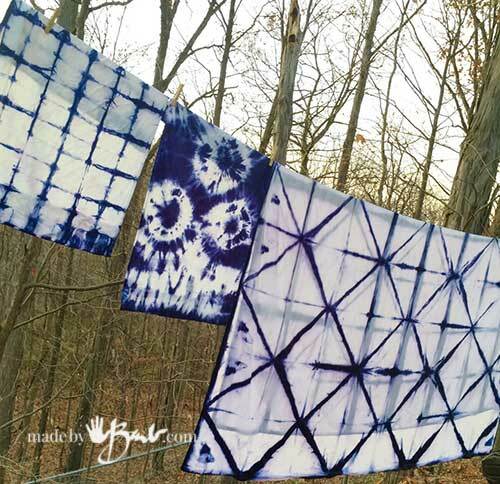 Hanging to dry makes it smell so much better and eliminate the wrinkles. 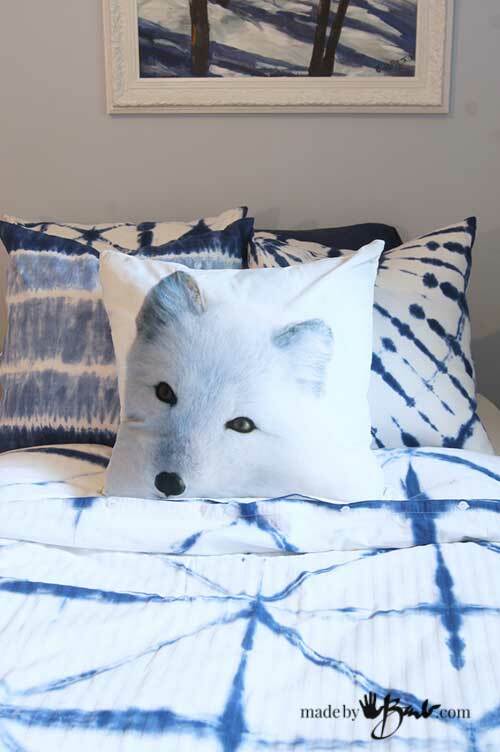 Why not add some pillow cases as well?! 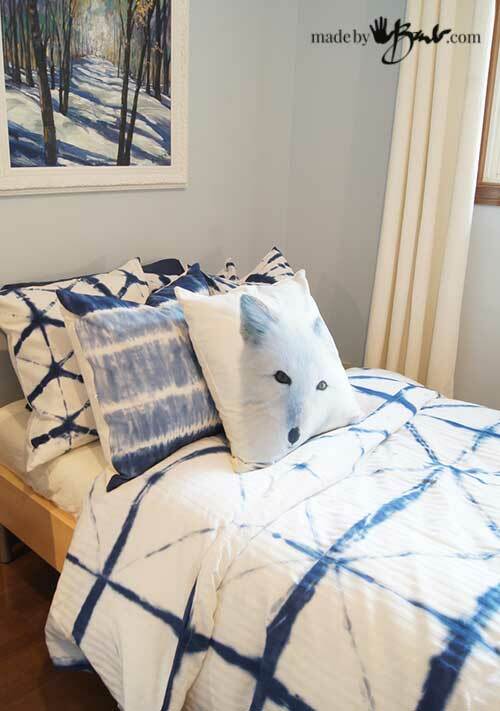 The complete ‘Blue Bedroom’ complete reveal will be posted soon as it has been a labour of love. 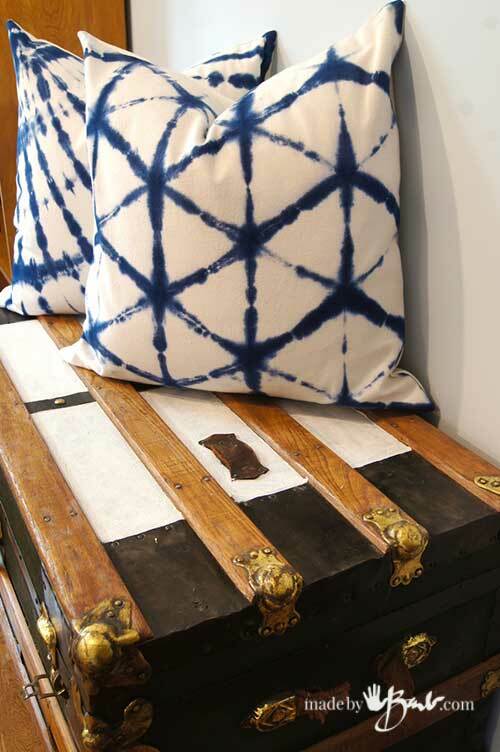 The Shibori dyed Chair makes me smile each time I see it. 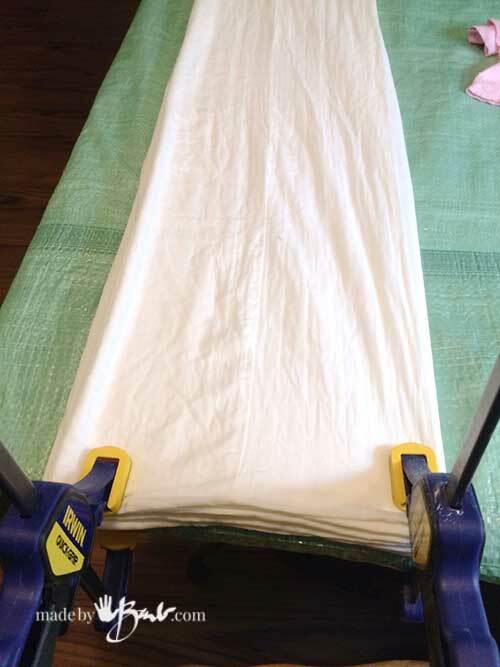 Perhaps you’d like to start small, ‘dip-your-finger-tips’ by starting with some easy pillows. Blue and white always seems fresh and clean. I’ll show you how to paint your own forest as well. I know you can do it; is my motto! 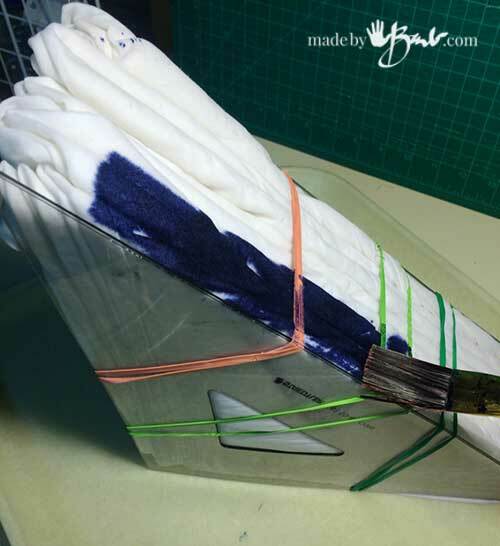 how ingenious … figuring out how to fold the heavy duvet so perfectly … and then using the plastic triangles to get inside and outside dyeing edges! Looks great! Yes, thanks! Sometimes I wonder how things just fall so perfectly into place. But then again improvising is sometimes the way new things are invented. It’s ALL good. Looks fantastic ! You make everything sound so easy. I truly envy your skills, imagination and energy. I will send photos when my pillows are complete. Thanks Pat! My goal in all my teaching is to make everyone believe they CAN do it before they think they can’t. After that, it’s just perfecting techniques… which is the fun part. I look forward to seeing the pillows and was thinking about you today. 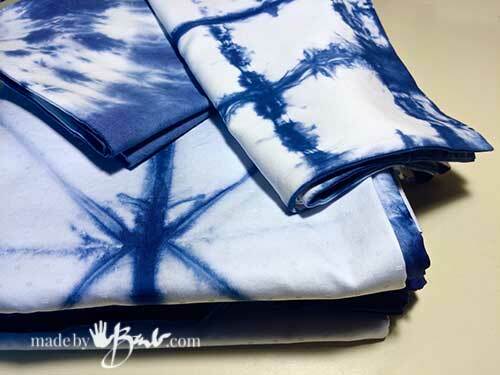 Unwrapping a bundle of dyed shibori is like opening christmas presents; even better since you know you will love it! 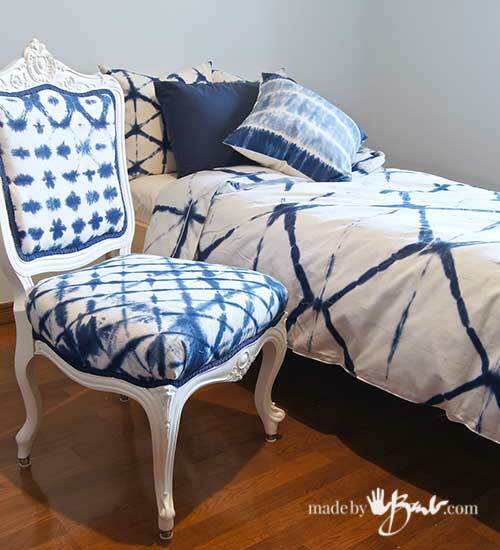 Here’s to our blue and white rooms!